Highly Therapeutic Joint Support. All Natural, 100% Active Ingredient. Pure, concentrated and easy to administer! Two Types of fast acting and therapeutic glucosamine, blended with chondroitin, MSM and Hyaluronic Acid. Repairs cartilage, prevents breakdown, and reduces inflammation, treating the cause AND symptoms. Support the healthy growth and development of your pets joints and cartilage at all ages, significantly reducing the effects and severity of common ailments associated with bone, tendons, ligaments, and joint structures. 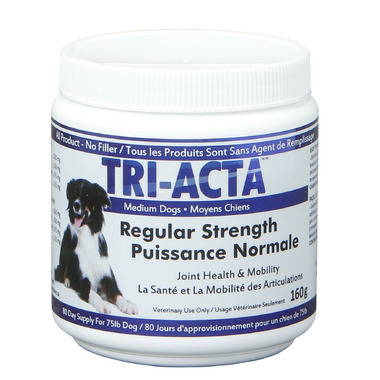 Tri-Acta has been optimally designed to protect and maintain joint tissues, increase mobility, minimize inflammation and improve joint condition. Tri-Acta normalizes cartillage metabolism, slows the breakdown of cartilage and allows the cartilage to regenerate.